The Fendler Rose is a member of the Rose Family. It is a small shrub which grows to 7 feet in height and has dark green oval leaves with ridged edges, which grow in groups of 3 to 7. The plant has short, reddish thorns which grow along the stem. The plant can typically be found growing in ponderosa pine forests at elevations between 5500 and 9000 feet. 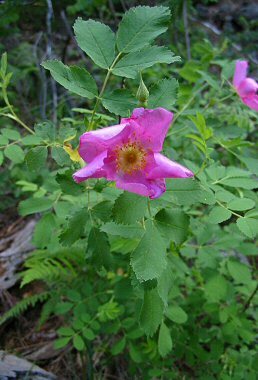 The fruit of the Fendler Rose is eaten by Native Americans as well as by birds and small mammals. The Fendler Rose blooms between June and August producing a fragrant, pink flower with 5 petals. The flower is followed by a berrylike fruit called a 'hip' which turns red when ripe.